Well illustrated plus timelines, glossary and maps. I have attempted to tell a remarkable story of some impressive people. As fiction, an editor would demand the plot was simplified and made more credible. Hollywood simply could not cope with such a cast of characters or unlikely sequence of events. Two young warriors, grandsons of the remarkable lady Godiva, faced not only the greatest warrior of the age but also his ally, earl Tostig. Tostig was none other than the brother of the recently selected, one could almost say elected, king Harold II of England. Tostig had been ousted in a coup the year before by those he faced at Fulford. Tostig’s plots and plans posed a strategic problems for England. His marriage had made him William of Normandy’s kin. But those he faced were also his brothers-in-law. They would soon be uncle to the heirs of the throne when Edwin and Morcar’s sister produced twins to king Harold. Sadly this is not Hollywood and there is an unhappy ending for all these good people. I do however, try to end on a happy note in the closing words of the book. I am very grateful to the many friends in York who have supported me in this enterprise and encouraged me to write this book. Special thanks go to Val Parker who has nor only got her hands dirty exploring the battle site but has undertaken the editorial work for the book. Could I encourage you to read the short section explaining how the literary sources have been used and reconciled with the available physical evidence. The battlefield is like a 1000 year old crime-scene investigation and I attempt to explain how the gaps and inevitable conflicts in evidence have been handled. 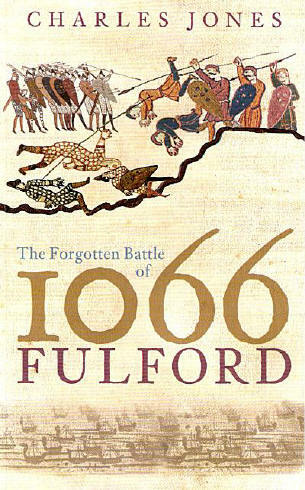 One question the book does not address is why is so little attention paid to this important battle of 1066. I hope this book will begin to redress this neglect.